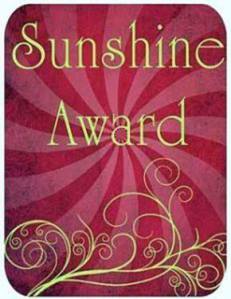 You Are My Sunshine Award! So it has come to pass that I shall be writing on my second award nomination out of my three, this time from the wonderful Drakulus. Thank you again Drakulus for nominating me for this award and I wholeheartedly endorse all those who read this blog to venture on your blogging quest or idle procrastinating distraction and look upon Drakulus’ blog. But I digress, for it is now that time again for me to nominate blogs and give you more facts about myself! The Sunshine Award is meant to be given to those who inspire you but seeing how I’m inspired by a great many things, and not only blogs, I’ve chosen blogs who interest me as I find interest much more worthy than inspiration as I find inspiration a misleading and damaging term to those who haven’t been included in this list. With the blogs now nominated, and I thoroughly encourage you to read and follow them, it is now time for that fun bit. Yes, it’s more facts about myself, and apparently I have to do ten this time! Hurrah! I have a habit of buying books by authors who have only written, or are only famous for, one book -i.e. : Sylvia Plath – The Bell Jar, Oscar Wilde –The Picture of Dorian Gray, etc. I enjoy a wide variety of music, from classic pop and rock like Buddy Holly and Roy Orbison, to metal like Breaking Benjamin, blues from Hugh Laurie, and J-Pop like Hatsune Miku. I grew a beard upon going to University not because I wanted to but because I could not be bothered to shave. I am a terrible for keeping in contact with people and rely on others to make sure I’m in the loop. I have only learned the Presidents of the United States and all the States and their Capitals, not because of school, but because of Animaniacs. If I could bring back one cartoon from my childhood for another series or a movie, it would be Samurai Jack. I once drove a train whilst on holiday in Wales when I was around six, though not very far and I was supervised. I have peculiarly gone through life without breaking any bones in my body, the closest being a sprained wrist from being tackled in football. I live through references and end up having to explain many to people who look really confused at what I just said. Until my final year of secondary school, I was very much a loner with only a small group of friends who I knew outside of school. Even now though I am still very hesitant about approaching people I do not know unless I absolutely have to. Well that’s me done. I hoped you liked it and will check out all the blogs nominated. Also special thanks again to Drakulus who you should definitely have a look at! Also don’t forget to follow me on WordPress and, if you want to suggest anything for me to write about, go and like my Facebook page and tell me about it there! So long! Somewhat of a Versatile Blogger! The Last, Final, Final and Last Sunshine Award! I hate shaving too, although I eventually succumb are bring out the razor as beards are itchy. You have to persevere my friend! You eventually get to the lovely fluffy stage and makes stroking it to make you think you look like a philosopher irresistible! P.S. Samurai Jack is back in the form of a comic! Just bought the first one. No problem! You deserve it. 🙂 Also… OH MY GOD! THIS IS AWESOME!!! Thank you so much for showing me this!